“Highly motivated individual needed to climb up and down unstable rocks all day at high elevation in an effort to study a very charismatic, but highly elusive small mammal. What am I talking about? Studying pika of course! Although American pikas (Ochotona princeps) may look a bit like a hamster or guinea pig, they’re actually most closely related to rabbits and hares. Pikas live in alpine terrain above the tree line. In California they are found at moderate to high elevations in the southern Cascades, Sierra Nevada and mountain ranges of the Great Basin. They live on rock-laden slopes called talus, and eat grasses, plants and wildflowers. Habitat loss has caused the disappearance of some pika populations, but climate change is considered to be the primary threat to the long-term persistence of pika populations in California. Mining, grazing, disease and other factors may also impact pikas. As part of my job as the Department of Fish and Game’s wildlife veterinarian for nongame species, I have been working with Dr. Janet Foley at UC Davis to study the health of pikas since 2010. Our goal is to find the best method to safely work with pikas and to determine which diseases could be a threat to pika populations by understanding what diseases are already present in pika populations. In order to study the biology of pikas and evaluate threats to pika populations, we need to trap and examine individual pikas. This is more challenging than one might think. Although it is relatively easy to see and hear pikas while on the talus, they are not particularly interested in entering a box trap for food. 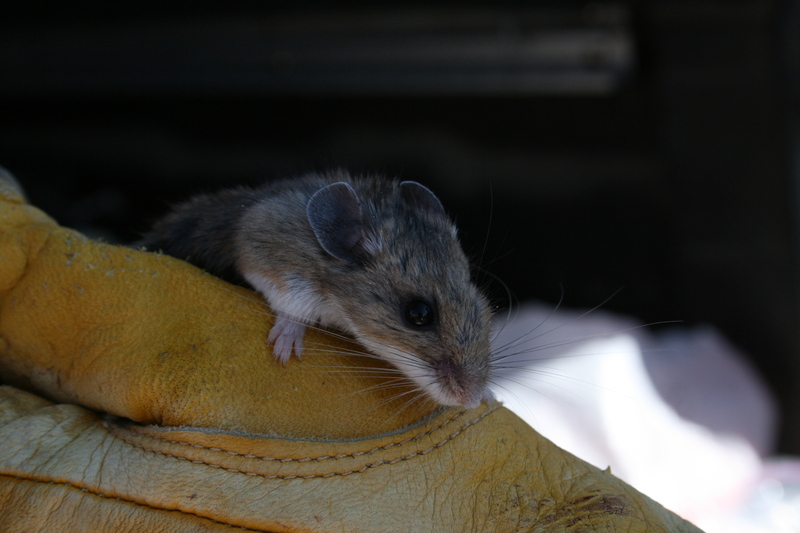 Also, since pikas live in remote areas, our teams often have to backpack into their habitat to study them. Accomplished pika researcher Dr. Chris Ray at University of Colorado-Boulder has given us sage advice on how to lure pikas into our traps. Although we were not successful at trapping pikas during our two short trips this summer, we were able to examine and sample other small mammal species that live in and near the pika’s habitat. Determining which diseases are present in other small mammal species that border or overlap with pika populations will provide important information about the diseases pika may be exposed to. Even though studying pika might be considered extreme field work, the effort is worthwhile because it gives us the chance to see this incredible animal and to gather information to inform future conservation efforts. We will be back climbing the talus next summer! 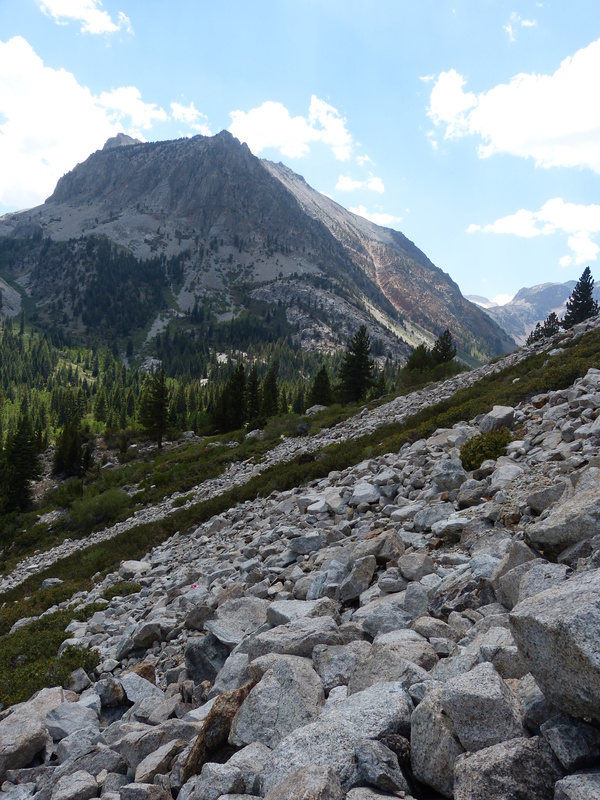 This project has been one of the research endeavors fostered by the California Pika Consortium (CPC). The CPC is an interdisciplinary collaborative effort that fosters research, monitoring, education, conservation and adaptation planning for pikas and other high-elevation species. 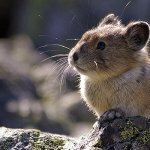 To learn more about the work of the California Pika Consortium, the National Pika Consortium, and to find additional resources about pika conservation and biology click here. If you are up for some extreme wildlife work, there are many citizen-science efforts to study pika populations, including: PikaNET, the ASC/I-naturalist Pika Project and Bristlecone Expeditions. ***Dr. Deana Clifford is the Department of Fish and Game’s wildlife veterinarian and epidemiologist for nongame, threatened and endangered species. We received lab results from the coyote that appeared to have died from anticoagulant rodenticide poisoning. This coyote was found in weakened condition in Strawberry (El Dorado County) in early June and brought into Tahoe Wildlife Care. It did not recover and was euthanized. The lab findings were not surprising: very high liver concentrations of the anticoagulant most commonly found in non-target wildlife: brodifacoum. 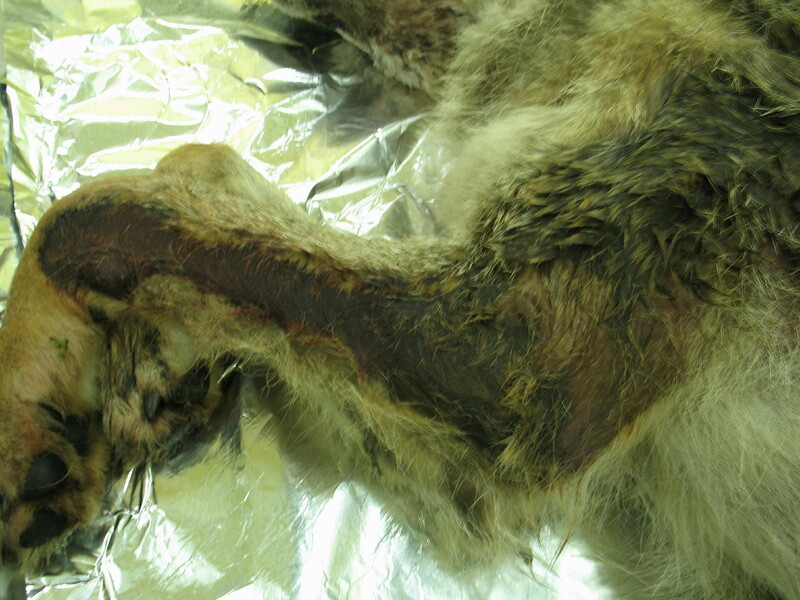 Another anticoagulant rodenticide was found in lower concentrations: bromadiolone. Anticoagulant exposure causes internal bleeding, including the subdermal bleeding seen here. Rodent poisons containing brodifacoum can be purchased at grocery stores and hardware stores. The U.S. Environmental Protection Agency has proposed limits on their availability but so far those limits are not in effect. DFG urges residents to protect wildlife in their area by limiting use of products containing brodifacoum, bromadiolone, and difethialone. These materials are the active ingredients in some rodent baits and have been found in a high percentage of our predatory and scavenging birds and mammals in California including hawks, owls, coyotes, foxes, mountain lions, and bobcats. When your pet goes to the veterinarian, he or she might recommend conducting hematology and serum biochemistry panel, a.k.a. “bloodwork”, to check the function of your pet’s immune system and organs. By comparing the results of the tests with normal reference data from healthy animals, the veterinarian is able to determine if there may be an infection or problem with organ function, such as kidney or liver failure. Wildlife veterinarians also conduct blood panels on wildlife species when faced with sick or injured animals, or health problems in a population. However, interpreting the results of these tests is often difficult because information about what is normal for a healthy animal does not exist for most wildlife species. For example, the blood values for a red fox cannot be accurately interpreted using the normal reference data from domestic dogs. For endangered species, the need for appropriate blood work reference data is important for population health monitoring and for care of sick and injured animals. One such species where this information was needed is the island fox, an endangered relative of the gray fox that exists only on six of the Channel Islands off the coast of California. 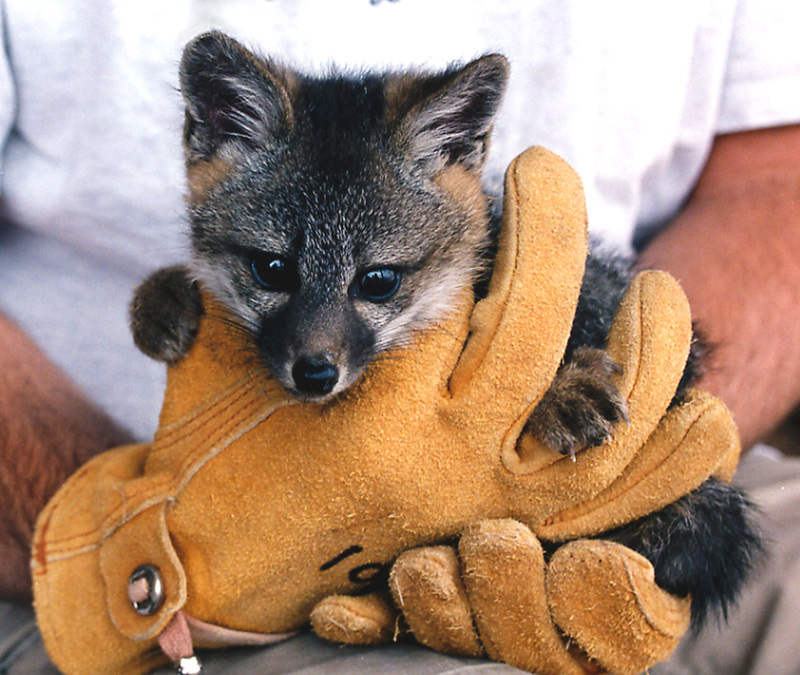 Four of the six island fox subspecies suffered dramatic declines in the late 1990s. Aggressive conservation efforts implemented by land managers at Channel Islands National Park, The Nature Conservancy and the Catalina Island Conservancy, government agencies and public and private organizations saved the four endangered island fox populations from extinction. As part of the effort to keep island foxes healthy, UC Davis graduate student Hiromi Inoue, worked with the WIL’s wildlife nongame species veterinarian, Deana Clifford, and a team of researchers from UC Davis School of Veterinary Medicine, the Institute for Wildlife Studies, and Channel Islands National Park to develop the normal blood value reference ranges for endangered island foxes. The results of Hiromi’s Master’s thesis are published in the July issue of the Journal of Wildlife Diseases. Congratulations Hiromi! Biologists and veterinarians can now utilize these reference values to better monitor the health of both the island fox population and to treat sick and injured foxes.